Sanskrit name Yuva literally refers to a young person. Yuva also refers to cadet or vigorous. Yuva is an ancient word which means young. Yuva is also used to denote cadet or a vigorous person. Mention of Yuva is found in Sir Monier-Williams dictionary where Yuva denotes actual base of the 2nd person pronoun in the dual number. As it is shown in the graph above, Yuva is a bit popular name in the USA. 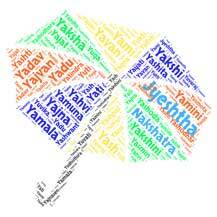 Yuva is used by some 11 people in the USA as the name of their kids. Yuva is a popular name in India. Yuva is used by more than 500 people in India as per social media records. Yuva is a short, sweet and stylish name. Yuva also has a nice meaning attached to it. Yuva (Youth), is an Indian political drama film directed by Mani Ratnam and released in 2004.